We will compile a full list of acknowledgements and a bibliography soon, but in the meantime wanted to note that we first learned about "Norma Trist or Pure Carbon" reading Kim Emory's wonderfully sprawling 1994 essay "Steers, Queers, and Manifest Destiny: Representing the Lesbian Subject in Turn-Of-The-Century Texas" in the "Journal of the History of Sexuality" (University of Texas Press) and read the novel on microform at Rice University's Fondren Library. We also want to thank University of Houston Professors Roberto Tejada and Raul Ramos for suggesting that we read Cabeza de Vaca's "La Relación" which inspired the route we took to photograph the bar sites. And to thank legendary Houston gay activist Ray Hill for insisting during our first research trip to Texas that for our Texas piece we ought to look into theories that Stephen F Austin (the founding father of Texas) was gay. While we probably won't tackle that one, we hope that someone does. 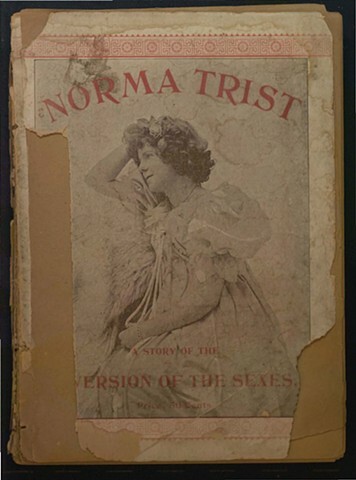 The great historian of LGBT American History Jonathan Ned Katz has written about Norma Trist as well and includes a bibliography of work about the novel and Carhart in addition to an essay that he wrote about it on his magnificent website outhistory.org. The Houston Public Library has a scanned copy of the original novel that can be accessed online, aand Google Books has a digitized copy from Indiana University. Image: courtesy of the Houston Metropolitan Research Center, Houston, Texas. Accessed through the Houston Public Library's digital archives.